The druid class is one of the few hybrid classes in the game (the others being shaman and paladin). The druid class is, as the only class in the game, limited to only two races. The difference between druids and other hybrid classes, is the ability to shapeshift. 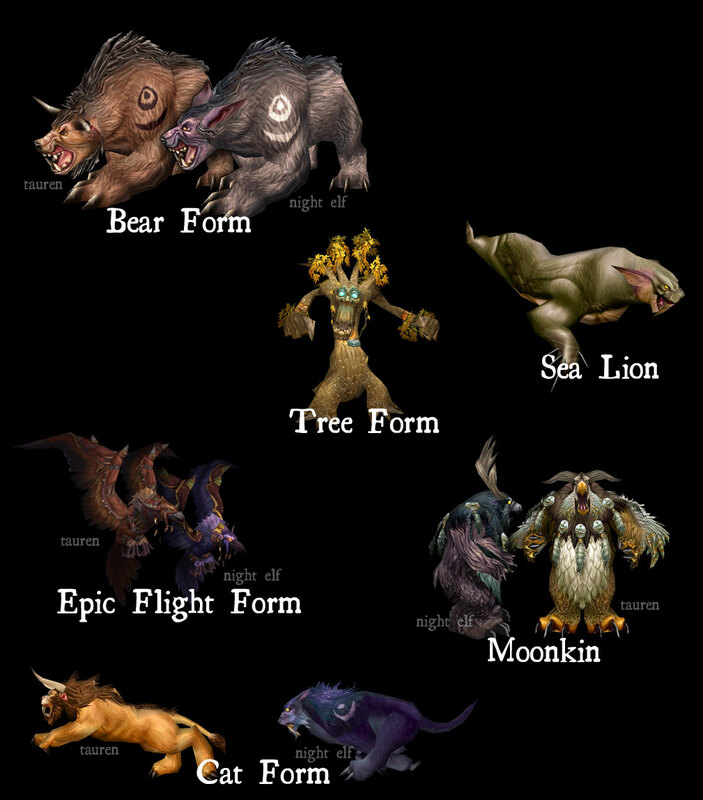 This makes the druid, unlike shamans and paladins, unable to use all abilites simultaneously as they are tied to different forms; Caster, tree, cat, bear, travel, sea and moonkin form. Most of these forms also performs best with different sets of equipment, so a druid needs to be prepared for the task ahead. Hence, one may say that a druid are not able to seemlessly perform all their abilities, like the other hybrid classes are. The druid may specialize in any of the following roles; healer (tree), caster damage dealer (moonkin), melee damage dealer (cat) and/or tank (bear). The cat and bear shares the same talent tree, so it's fully possible to combine these. Of course, as a hybrid, you don't necessarily need to specialize in one area, if you'd like to do more than one thing. However, when it comes to end-game raiding, druids (as well as the other hybrid classes) usually are expected to chose one area of expertise (and roll on loot accordingly). With the right equipment, a druid have more health and armor than any other tanking class, making them a good choice for melee heavy fights. As a support class, the druid really excel. For normal instances, it's a life saving class who can quickly shift into bear form to off-tank, shift out to caster form to heal, and so forth. Access to the most powerful HoT's in the game (Healing over Time spells). Great buff (Mark of the Wild) that can be cast on any friendly target, in or out of group doesn't matter. Can specialize in any of the roles available in-game. Access to a superb mana regenerating spell called Innervate. No matter what you specialize in, this will always be available, and is best spent on a healer. Druids are the only class in the game who can resurrect a friendly player whilst still in combat, which sometimes can make the difference between success and wipe. However this can be done only once every 30 minutes. When you reach the harder instances, you can't do it all at once; you have to be prepared gear-wise for the task at hand. You won't be able to do much damage in healing gear, and you won't be able to heal very good in damage gear. And so on. When in a form, the abilities and spells available are severely reduced. Shifting in and out of forms costs a hefty amount of mana. Can't drink potions whilst in forms. Weapon DPS and Weapon procs has no effect in bear and catform. The healing spells that are not HoT only are rather mana expensive. Being a moonkin, you'll run out of mana faster than other caster classes. Druids are the only "healing class" that has no resurrection spell, apart from their one-time combat resurrection once every thirty minutes. Bring someone who can resurrect, if you grab a druid healer. Limited Crowd Control spells; entangle does not incapacitate the target, it only roots the target in place, and only work outdoors. Cyclone has a very short duration. For more information regarding the different armour sets, please check out the Druid Armour Sets section. "While the Tauren teach that Cenarius instructed them first in Druidism, as recounted in their myth Forestlord and the First Druids, It was in fact Malfurion Stormrage who was the first mortal druid, and Cenarius's greatest student. He would lead the night elves through the War of the Ancients and the long years that followed. With the creation of the World Tree Nordrassil, the kaldorei Druids were bound to Ysera, and her realm, the Emerald Dream, in which they spent centuries of their immortal lives. The Cenarion Circle was formed as the governing society of Druids, based in the sacred Moonglade. Locked in slumber in their barrow dens for generations, the Druids awoke to meet the threat of the Burning Legion during its recent invasion. After Archimonde's defeat, the Druids chose to remain in the waking world and help to rebuild their shattered lands. The Legion's attack left a terrible scar on the natural order, and the Druids seek to heal it. The Night Elf Druids were recently joined in the Cenarion Circle by the Tauren. During the war, Malfurion had befriended Hamuul Runetotem and taught him of druidism. Hamuul later became the first tauren to join the Cenarion Circle and later the archdruid of the Tauren race." For more information regarding lore, please click here (external link).